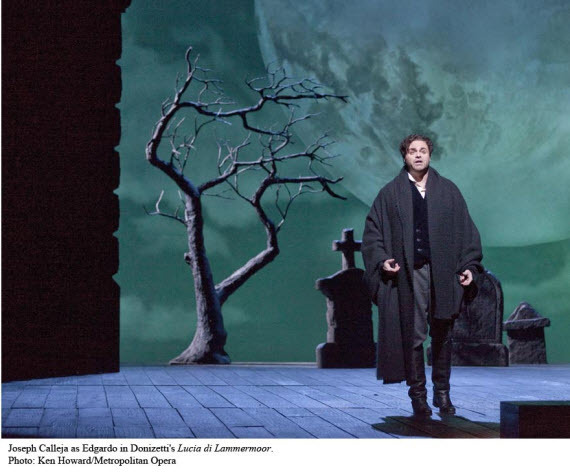 Today the Met brought back its production of Donizetti’s masterpiece Lucia Di Lammermoor. It was telecast just a little over two years ago with Anna Netrebko, Piotr Beczala, and Mariusz Kwiecien in the principal roles. This time the opera had a new set of performers – Natalie Dessay, Joseph Calleja, and Ludovic Tézier. The production by Mary Zimmerman is just as poorly conceived as it was when it first appeared. The photographer who moves about during the great sextet is still as annoying and distracting as before. Ms Zimmerman went on to destroy Bellini’s La Sonnambula. She got through Rossini’s Armida without causing mayhem, but I wouldn’t let her into an opera house without a ticket. The performance was rescued by Donizetti and the singers who overcame anything the director could throw at them. Natalie Dessay’s impersonation of the title role was both vocally and histrionically first rate. Her approach differed from that of Netrebko; it was more ornamented and embellished. She sang more high notes. It was typical of the portrayal that Donizetti’s fragile heroine usually gets. Dessay took the middle of the Mad Scene, the part usually accompanied by a flute a capella. Netrebko opted for a glass harmonica. She made only two missteps. The first was holding the high note at the end of ‘Verranno a te sull’aure’ for several seconds longer than tenor Joseph Calleja. He didn’t finish short, she went long. A display of prima donna bad manners. The second wrong decision was her pushing Arturo away and storming into the fatal bedchamber in the second act. Lucia is not angry, she’s unhinged. But on balance it was a fine performance. Ms Dessay has an exuberant personality which doubtless contributes to her art, but she would be better off if she didn’t ululate when taking curtain calls. Joseph Calleja has become a favorite at the Met. His voice was compared favorably to those of Beniamino Gigli and Jussi Björling in the promotional material screened before the telecast started. This is a fantastic stretch. He has a pleasant and bright tenor that lacks ping at its highest range. The annoying rapid vibrato that has been part of his voice since he first appeared on the international scene had abated a bit. The voice does not have a distinctive personality that marks the really great voices. He has a pleasant and affable stage presence and didn’t seem to mind Dessay’s extra long high note during the interview that they both gave immediately after the offending note. He seems just another very competent singer. But I must concede that the audience both in the theater and at the Met reacted to his performance with great enthusiasm. So maybe I’m missing something. The two best Edgardos I ever heard were Richard Tucker and Giuseppe Di Stefano. While their interpretations were poles apart they both were good enough to rate a trip to the opera house just to hear them. I wouldn’t make such an exertion for Calleja. Ludovic Tézier was the villainous Enrico. He has a dark and plangent baritone that made you want to hear more from him. He was Marcello in the 2008 telecast of La Boheme. In my review of that performance I wrote that he had the best voice in the cast and that I’d like to hear him in a bigger role. Well, I still feel that way. He first sang at the Met in 2002. Today was his 34th appearance at the New York house. His voice sounds like it should be ideal for Verdi. I don’t know if the French baritone will get a shot at a major baritone role at the Met, but he deserves to have it. Kwangchul Youn was Raimondo. He’s remarkably short for a bass, but his vocal stature was more than sufficient for the part. The rest of the cast and the chorus were all up to the highest professional standard. Patrick Summers conducted with authority and, of course, the orchestra was excellent as is typical these days for the Met. In summary, a very good performance (the staging aside) of a great opera, but not one that will stick in your memory for life. So now we have two HD renditions of Donizetti’s stable. Doubtless they’ll both become available on discs. Both versions are very good. If I were going to buy just one, I think I’d go for Netrebko and Beczala – but it would be a close call. Zimmerman’s staging would likely make me opt out all together. I have a clip of Dessay’s mad scene with glass harmonica. Much as I adore the lady, I think her greatest talent is for comedy. Yeah!! I’m stuck with the SF 1960 Sutherland Lucia. Am spoiled!! I just got back from the Encore performance. I saw the final dress rehearsal (back on Feb 21) and they did have the glass harmonica (I’m almost positive) Dont know what happened. Did hear Ms. Dessay comment that she would have preferred glass harmonica. I thought all the singers were fine and I also agree that the production was kind of weird. Never saw Sutherland live in Lucia so can’t compare, but I thought Dessay did a fine job. A very enjoyable evening. I saw Sutherland before she went to the Met and the voice was from another galaxy. Mesmerizing…unbelievable….and at a tender 16 years, that was my very first opera performance. Not to be equaled until I saw Corelli in Chenier and Tosca!!! So lucky for this provincial fanciulla. What a first opera! My first was a ‘student’ performance at the old Met (it had to be a student performance because it was during the school day and I still have the note my mother wrote to excuse me from classes; maybe it was a dress rehearsal) and it was Gounods Faust! I was only about 11 years old but I was hooked (and have to day I’m now an addict)! I saw Sutherland at the Met past her prime but still wonderful. My college roomates always kid me about her LP ‘Art of the Prima Donna’ which I played the grooves off of my senior year! She was doing a signing of her book at the Met some years ago and my daughter stood in line for 4 hours to get her book signed for me for my birthday. My daughter said she was very gracious and charming. After 4+ hours of signing books. She was just wonderful. I was talking to a gentleman after the Encore performance last night and he had seen her in a live Lucia near the end of her career. Said it was wonderful but he thought this performance was even better. I saw her much later in Die Fledermaus with….Sills. And in concert with hubby at the piano…..so excited he was hitting many wrong notes… such passion. ME TOO!!! Guess we’re both canary lovers……. ******Gounods Faust! ****** I lucked out there too…saw Triegle, twice, and have had no other Faust devils after him. Tézier is absolutely amazing in Verdi indeed. His breath control is out of this world, and he has exactly the kind of brooding, noble tone (and appearance) Verdi needs. Just watched him in a Rigoletto and he was fantastic.